Summary: Kacey Cleary’s whole life imploded four years ago in a drunk-driving accident. Now she’s working hard to bury the pieces left behind—all but one. Her little sister, Livie. Kacey can swallow the constant disapproval from her born-again aunt Darla over her self-destructive lifestyle; she can stop herself from going kick-boxer crazy on Uncle Raymond when he loses the girls’ college funds at a blackjack table. She just needs to keep it together until Livie is no longer a minor, and then they can get the hell out of Grand Rapids, Michigan. Review: I have been absolutely dying to read Ten Tiny Breaths after I fell in love with the New Adult genre. With a 4.22 rating on Goodreads, I knew that I would love this book, and I'm happy to report that I did just that! After a drunk driver killed her parents four years ago, Kacey Cleary's life has been far from paradise. Living with her conservative aunt and uncle, Kacey knows that she and her younger sister Livie have to get out of there in order to start fresh. When their uncle loses their inheritance and tries to advance on Livie, Kacey takes her sister and runs away to Miami to start over. All Kacy wants is to forget the pain from her past and give Livie a life she deserves, which means forming absolutely no connections with anyone. But when she meets her mysterious neighbor Trent, she can't fight what she feels as she spends more and more time with him. Trent has a secret past, though, that may break Kacey's new life and ruin everything they've built together. OH MY GOSH. I knew that people have loved this book. But, oh my gosh. It was good. I loved how Kacey had such a close relationship with Livie and wanted to build an entire new life for her. Livie was so gosh darn cute and I loved how she was such a good person. Because of Livie, so many interesting people became involved in their life (like Storm and her daughter) and that made me that much more invested in their lives and their story. And, oh my gosh, that plot twist? I've read some reviews say that they knew it was coming, but I had no idea! I was thrown for a loop and it made me read on that much faster. I could not put this story down until I had read every last page. As for the romance, I liked the connection Kacey and Trent had and how they grew to trust each other and let each other in. Kacy definitely did not give into Trent right away and I loved how she had kickboxing as her outlet. It was fun to see how the main character had a life of her own and wasn't completely immersed in her romance. I'm not quite sure how Kacey could work as a bartender since she wasn't even close to being 21 yet, but I thought her job at the club Storm worked at was fun and I loved seeing her with the people she worked with. Oh, and it also gave Trent a fun way to win over Kacey. I'm excited to see the people from the club in the later books of this series because they definitely captured my attention. How have I not read this book until now? I am dying to read the rest of the books in this series because I became so invested in all of the other characters and can't wait to see them find their own happy ever afters. There was so much intensity and emotion in Kacey and Trent's relationship that my own emotions were a jumbled mess when as I read the book. 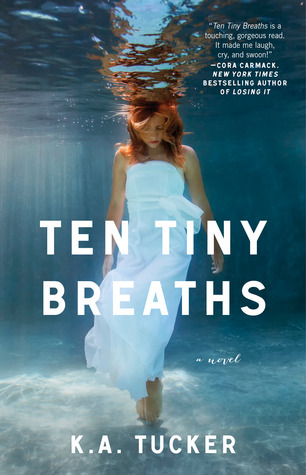 If you haven't already, definitely check out Ten Tiny Breaths. You're missing out on an amazing NA book with an even more amazing bunch of characters. I've heard nothing but great things about this book. I really want to read this one soon, I don't know why I haven't read it yet. This sounds really good! I'm not sold on the New Adult genre YET, but I do have a copy of this to read - whenever I get round to it!